The first whisky auction of August (Scotch Whisky Auctions) highlighted the continuing demand for Japanese whisky, predominantly Karuizawa. Fifteen of the twenty most expensive lots were from this now legendary, closed Japanese distillery with Scotch accounting for just five. In value terms the top twenty lots fetched £66,400, of which £51,900 was from Karuizawa – 78% of the top 20 by value was Karuizawa… Demand is clearly vast. The most expensive bottle of the whole auction was a 1995 vintage 18 year old Karuizawa. Just 22 bottles kicks the rarity ball right out of the park with this one…. But £11,000! Incredible. In more general terms, while there were a number of new record prices these were for exceptional rarities; more current voluminous releases under-performed. 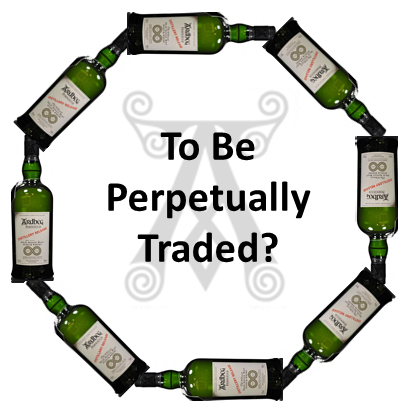 The above image was used in one of our previous posts, however, to be perpetually traded is certainly correct in this case with a staggering 47 bottles of Ardbeg Perpetuum Distillery release making it to auction. Again, showing patience is key when buying a relatively high volume limited release, the first three bottles to hit auction in the UK (at the same time) sold for £400, £410 and £490; an average of £433. With a current average of c£155, that’s an auction to auction loss of 64.2% since launch. Will this bottle ever recover to previous levels? Not for a long time, if ever. Macallan’s Folio 1, Archival Series pared back its recent performance as two bottles sold for £210 each. With a high of £425 just two months ago, this is another clear reason not to get carried away with bidding on the first bottles to hit auction. More positively, three Burns decanters all sold for prices far in excess of recent sales – £2,000 to £2,300 took the bottles way ahead of the previous £1,200 – £1,500 trading range. Mortlach’s G&M bottled 1957 50 year old (514 bottles – first fill sherry) last sold for £320 in 2013. Almost three times that was paid when £900 sealed the bidding here. 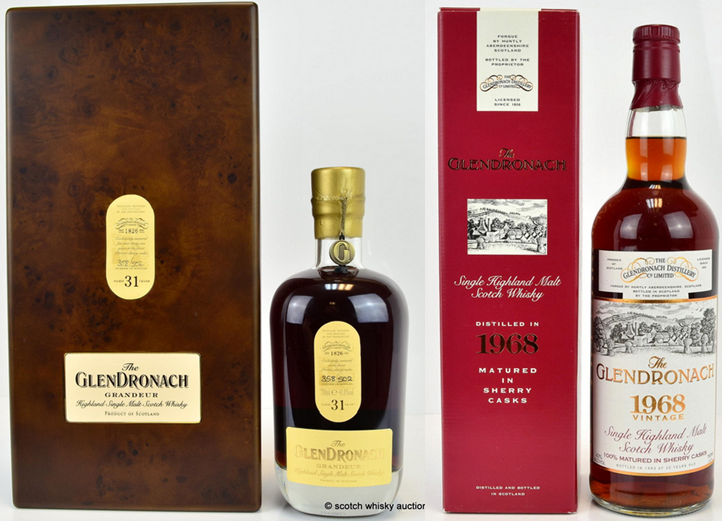 Staying with sherried Scotch, the current go-to provider of sherry-bombs, Glendronach, had an impressive set of results. The highly regarded 1968 25 year old achieved a record £760. In 2009/10 these were selling for £150 – £180. Batch two of Grandeur, a 31 year old, fetched £600 far surpassing its previous £410 record. Both Port Ellen and Brora performed broadly in line with current values. No record prices were achieved; if anything Brora prices stepped back a little. The most significant increases are currently being seen for both distilleries through indie bottles rather than the official bottles. There were, however, some signs of upwards pressure on OB Port Ellen’s, a signal of another up-shift ahead? With just 54 bottles released, it was little surprise to see the Douglas Laing bottled 1968 34 year old Glenury Royal achieve a record £660. £490 was the previous high for this bottle. Also bottled by Doulas Laing, a bottle of Millburn 1976 25 year old achieved £230 comfortably exceeding its previous 2014 price of £175. A bottle of Rare Malts Selection 19 year old St. Magdalene fetched a record £620. In 2008 this was selling for just £100. The previous record for this bottle was £520. We’ve previously advised collectors keen on selling not to do so in the summer months. History shows us summer month sales can take a dip in hammer price terms. Whether that had anything to do with the distinctly average performance of many bottles can be debated; however, the more voluminous releases took a clear dip… But with 47 bottles of the same thing in one auction we should really expect nothing else.